Star Wars Mythos is and isn’t a new line. Sideshow has been cooking up a series of sixth scale figures with that label for months now, with the Obi-Wan Kenobi figure being the first in the series. What is new though is another line dubbed Star Wars Mythos. This one centering on art prints. 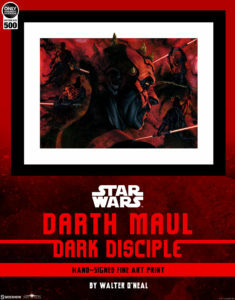 Starting with the Darth Maul print by Walter O’Neal that you see here, Mythos Fine Art Prints are meant to compliment Sideshow’s statues and figures of the same name. The piece is called “Dark Disciple”, and will be limited to just 500 pieces. Each one will be signed by O’Neal too, giving it some added collectibility. Pre-orders will kick off on July 20th, between noon and 3pm pacific time. Since this is Sideshow, and there’s nothing chintzy about anything they do, you should not expect these to be cheap. The framed version of Dark Disciple will run you $260 USD. Unframed? If there are any left, unframed copies will go on sale on Monday the 23rd (also between 12 and 3) and will run you $100.